Motorized Air Craft Lavatory Cart is used to carry the waste from the Aircraft. The unit is equipped with all the latest fittments. Please contact us for detailed technical specification. Our firm is ranked amongst the reputed names in the market for offering an extensive range of Landing H. Besides, we present this series to our clients at nominal prices. We are an industry leading provider of equipment, systems and facility maintenance services to airlines and airports throughout north america. - Grade t6 temper. hindalco make step made up of of 26mm x 3 mm thickness non slip, extra grip checked sheet steps high quality polymer wheels mounted on a ms trolley along with brake. 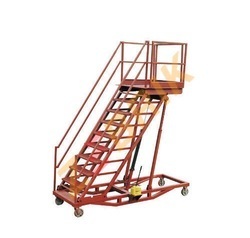 Aluminium Airport Ladder are specially designed with small lockable wheels for easy mobility. They are provided with mild steel basement for sturdiness. They are highly acclaimed for their robust designs which help them last for long time periods. They are affordably priced. 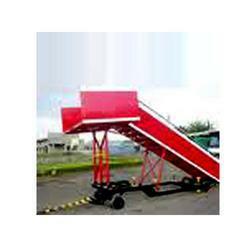 We are one of the most reliable companies in this domain and are into offering Aircraft Ladder. At both main airports, Mumbai and Delhi, Cambata Aviation dedicated Ground Support Equipment (GSE) Maintenance Department offers scheduled, preventive and emergency maintenance service for all types of ground support equipment. This is inclusive of heavy maintenance and rebuilding. The CTX 5800 represents the next generation in CT explosives detection system (EDS) technology; combining advanced high-definition 3-D imaging (HD3-D) baggage screening and a compact footprint to fill a variety of security applications. The Airport Extreme from Apple employs simultaneous dual-band Wi-Fi and has a Gigabit Ethernet WAN port and three Gigabit Ethernet LAN ports. Unlike many Apple products, this router is not Mac-centric; it can support local area networks with Macs and PCs.